Sasha Banks tried to quit WWE after losing her title at WrestleMania. Sasha Banks and Bayley were the inaugural women's tag team champions after the Boss 'N' Hug Connection won the titles at Elimination Chamber by defeating five other tag teams. 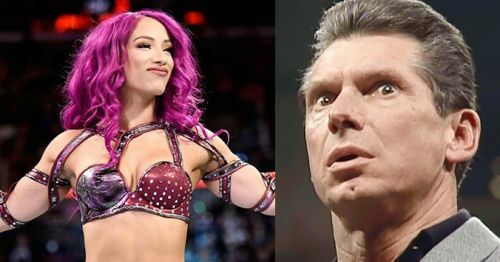 Reportedly, Sasha and Bayley were the ones who kept urging Vince McMahon to introduce the titles. Sasha and Bayley would go on to claim the titles and thought that they would get a lengthy title reign and would be able to establish some prestige to the titles. Their dreams came crashing down when they were told to drop their champion at WrestleMania. The IIconics became the new champs, and there's a new team coming to challenge them, which keeps the Boss 'N' Hug Connection out of contention for the foreseeable future. According to reports, Sasha tried to quit the company after her loss at WrestleMania, but the officials gave her a few weeks off to think about her decision and have refused her release request. Here are 5 possibilities to bring her back in. Money in the Bank is one of the most over gimmicks in the entirety of sports entertainment. Cashing-in of the contract always generates a reaction from the crowd and usuall y has a great storyline attached to it. It is considered as the stepping stone to reach the next level and remain in and around the title scene until the cash-in happens. The former winners weren't appreciated enough by the WWE Universe and even their cash-ins and subsequent title reigns weren't very memorable. This is where Sasha Banks comes in. The decision to crown her the winner would be mutually beneficial for both the talent and the MITB gimmick as it could result in a proper storyline that would be engaging for everyone involved. Also, this would provide Sasha a ladder to reach the upper echelon where Becky, Charlotte, and Ronda sit.